Across the humanities and social sciences, academic publishing is in a state of crisis. University presses are rethinking their lines and adjusting strategies in response to cuts in budgets and changes in the industry. Not only are journal subscriptions increasingly expensive, forcing universities to cut back on their acquisitions, but journals themselves are struggling to secure the unpaid labor they once relied upon. As Antonio Gramsci would remind us, moments of crisis are also moments of great opportunity. In this spirit, this panel draws from lessons learned in the past, and projects into the future the full potential of the publication, as imagined through a feminist lens. With Jacqueline Wallace, my contribution to the panel (which was divided as 1-past, 2-present and 3-future of the Fembot/Ada project) was to focus on the ‘now’ in terms of both the state of academic publishing and the status/trajectory of Fembot. 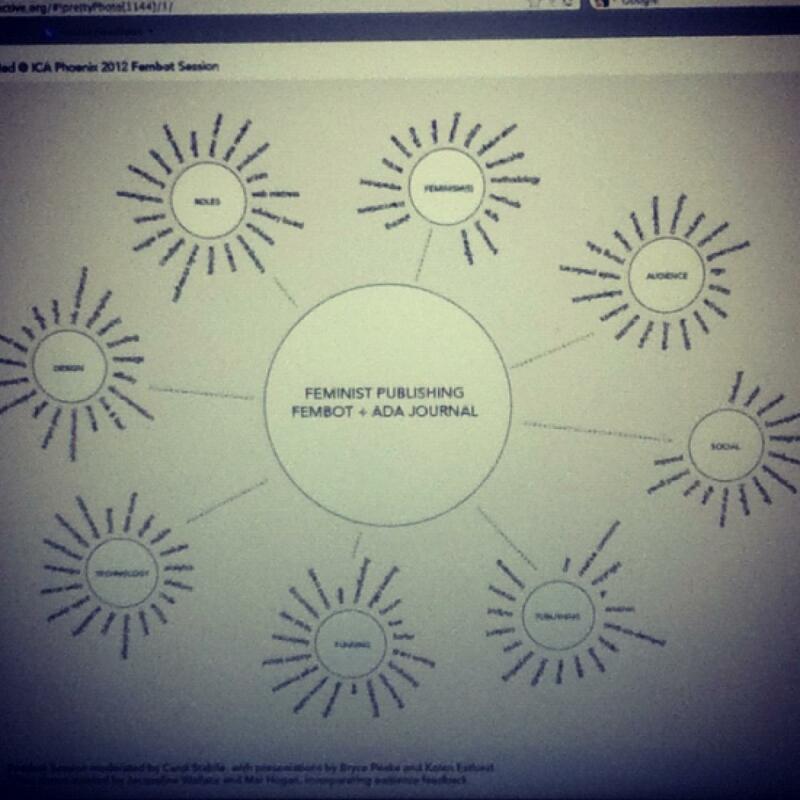 Flanked between Karen Estlund’s stellar overview of the not so varied and problematic trajectory academic publishing, and Bryce Peake’s perfect metaphors for the future, we pulled out a hand-made word cloud charting the keywords surrounding feminist publishing, based on questions such as: what is academic publishing? Which roles get valued (which ones don’t)? What can Ada do differently? And, so on. The idea was to glean new keywords from the audience discussion and integrate new additions in a fresh — but always iterative — infographic.